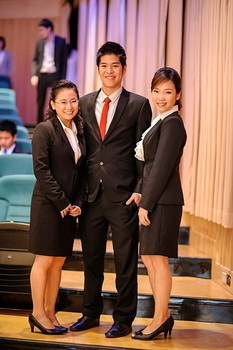 Young Financial Star Competition (YFS) is a national competition held by The Stock Exchange of Thailand associated with Kasikorn Bank Pubilc Company Limited, Muang Thai Life Assurance Company Limited and PTT Public Company Limited. The competition aims to enhance knowledge on investment planning, personal finance, insurance planning, and corporate social responsibilities to the new generations. The second-runner up award up of PTT CSR Star team. We have never imagined that the competition would provide us with such a tremendous learning experience. During the last 5 months, intensive lectures, challenging cases, opportunities to interact with executives, and collaboration with new friends from many universities have allowed us to develop our knowledge on investment theory, financial market insights, as well as interpersonal and presentation skills. Looking back, it was definitely an invaluable experience. Therefore, we highly encourage future BBA generations to give yourself a chance to participate in this competition. You never know what you are capable of until you push yourself beyond the limit! And last, we would like to attribute all the success to our BBA family who have provided not only great education, but also precious mental support. We wouldn�t be able to achieve this without you. Posted date: February 24, 2012 � 09:15 hrs.